America now suffers the most extreme inequality of the industrial world, as the broad middle class continues to sink. Why does the U.S. no longer enjoy widely shared prosperity? The most popular explanations focus on the changes wrought by globalization and technology, and the transition to a service economy. The most touted remedies are greater education and more worker training. But, if history is any guide, the most important policy is too often the least mentioned: workers regaining a voice at work, through organizing and broad-based collective bargaining. The power to bargain across entire sectors of the economy enables workers to demand a fair share of the profits and productivity they help to create. A voice at work limits executive excesses and curbs wage theft and other fair labor violations. 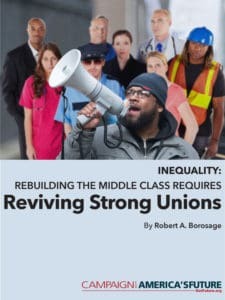 Though down to 14 million members, unions remain one of the largest membership groups in the United States. Polls reveal that far more working people would like to form a union than now have one. But the rules that have been rigged against workers – from the rules of the global economy to the trampling of labor laws – have to be changed. Government policy helped strengthen the hand of workers and build the middle class coming out of World War II, and today government must once more become an ally of working people. The effort to make that happen will meet fierce resistance, but the report shows that the first steps have begun.